First, I would like to say thank you to Frontline for airing such a program as "The Jesus Factor". It was very insightful and realy made me think. I too am a born-again Christian, but as I read through some of these "thoughts" it disturbs me. There are so many problems in this world that need our attention right now. Do we have nothing better to do than argue about our President's religious beliefs? Thank you Frontline for offering insight with all your documentaries. Your ability to challenge viewers is a much-needed service to the public airwaves. The recent re-broadcast of 'The Jesus Factor' is a testament to the one-sided viewpoint of this current administration. Any president, who holds up the bible and states that the words written within is a guidebook, discredits all other faiths beyond Judeo-Christian dogma. As a secular citizen, I worry deeply that self-prophesy based on biblical scripture tends to dictate most religious faith, which in turn will dictate our current administration's goals & pursuits. So I thank Frontline for airing such viewpoints inherent in the Bush administration, and I hope that during the course of the next 4 years, US citizens retain a watchful eye rather than one of apathetic allowance. George Bush and his fellow Evangelicals scare me. I go to church on Sundays and look to my pastor and fellow parishioners for spiritual guidance. President Bush was not elected to be our "spiritual leader"; he was elected to be the leader of our government. As a fellow Christian who believes Jesus Christ is our saviour, I totally respect President Bush's faith but there are millions of Americans who are NOT Christian and should be able to depend on President Bush as their leader using objectivity and the laws of government to protect our country and its citizens; not scripture. Simply stated, politics & religion should not intertwine. I am an Asia-American and a born-again Christian. I love America as my country with all my heart. After watch Frontline "The Jesus factor" program. I make up my mind that I shall pray for President George Brush diligently. It is hard to be a president that he has courage to standup his believes. He needs courage to face the public pressure. Therefore, I really praise President Bush for it. Thank you for airing a balanced view. This was the first time I had watched FrontLine and I was impressed. I have read the majority of the postings and the one glaring issue I see is that people of Christian faith feel as if anyone who disagrees with President Bush's view are ridiculing him because of his faith. Several postings brought up past presidents that haved used faith "cues" while in office without any notice. They also point to our Founding Fathers as all being God Fearing. Faith (of any kind)in public policy is a very important issue. It is important enough that people should read more history instead of going off about what our Founding Fathers believed or did. History also shows that any time faith is allowed to have a strong role in public policy, it corrupts both and disaster follows. I strongly support an individuals right to believe in God (or no god), I do not support having their views pressured into my life. Thank you for an excellent, even-handed program, which I think did a much better job of portraying evangelical faith than is generally true of the secular media. An evangelical Christian myself (though I prefer to go by "follower of Jesus"), I am troubled by the growing religious divide that seems to characterize our country; and by the extreme positions taken on both "sides" of the religion-in-politics issue. I dislike so-called "conservative" Christians who simplistically want to "take back" America for Christianity (and I don't think that President Bush is one of these); and I dislike the anti-Christian or anti-religion positions, which act as if someone who has religious convictions should not let those convictions influence his/her decision-making or public leadership, and that somehow those who are not openly religious are somehow "neutral" (value-less, or religious-value-less) when it comes to decision-making or leadership! Everyone has values which shape his/her decisions, and I would much rather have a President with moral values rooted in the Bible or specifically in the teachings of Jesus (love your neighbor, love your enemy, and numerous teachings on forgiveness, reconciliation, doing good to others, etc. ), than one who draws his/her values from any other source (and generally speaking, not to have values rooted in a source like the Bible or Jesus, is to have values which are not particularly rooted in any source). And this ties in to the Iowa debate, when the candidates were asked what philosopher they most admired. Some people act as if Bush's saying Jesus Christ indicated some sort of mindless religious fanaticism; whereas it is easy to make a strong case for Jesus being one of if not the most significant philosophical teachers in the history of mankind (for the influence of his teachings on human history). I know many people who are not Christians (Gandhi, for example) who had a great admiration for Jesus' teachings, and strive to follow him. All this is to say, I think we in America need a more open discussion of the place of faith and various moral teachings (of different sources) in the political arena - a discussion where we listen to each other and try to consider matters unemotionally, rather than just taking sides and attacking each other. Again, thanks for this interesting, informative, and excellent program! First of all, I applaud Frontline's unbiased presentation. I enjoyed the how the different views on President Bush were presented. After reading through many of the comments, I found very interesting that so many listeners seemed to take offense at the idea of saying "God is on our side." Is it really that ridiculous for a Christian to believe that God is on his side and that if he is trying his best to obey God, God will help him? It would certainly be ridiculous to think that God was against him. I also thought it was odd that some people could think that because a person tries to follow his religious beliefs, he is somehow unintellectual and relying on blind superstition. What is so unintellectual with acknowledging that there is an authority higher than oneself, to whom one ought to conform his life to? I think it's more about humility than blind superstition, because it's acceding that people do not in fact know everthing. Thank you for the Jesus Factor. I cannot believe that Bush really believes he is doing God's work. Jesus talked peace, he threw the money changers out, he worked for the poor. Everything he did was to try to offer a better life. What Bush has done (is doing) is the very antithises of Jesus' teaching. A moral man, would clean his own house, before telling others how to live. I would like to tell Mr. Bush, that we live in a republic and we like it. We do not want to live in a throcracy. Typical of liberals Mr Wallis misquotes Mr Bush and then erects a strawman argument against him. Example: Mr Bush referred to our being a repository of hope and that hope being a light in the darkness, then vowed that the darkness will not overcome that light (hope). Mr Wallis accuses Mr Bush of elevating himself to the level of savior. As usual, he, the liberal, missed the point. Most of your report is fair and balanced, but when you let liberals speak, especially when they purport to quote a conservative, you must check every word and pin them to the truth. As do many of the evangelicals you cited I understand what Mr Bush is saying. He is a man. But a man who has surrendered to a higher power. He invokes that higher power in all of his decisions, and I believe he has chosen the right power and should defer to that power in his decisions. As an African-American, I have supported President Bush because of his faith and have asked God to show His people in America who "President George W. Bush is". Your Frontlines show 'The Jesus Factor is an answers to prayer. A number of the people reponding in this discussion state that their view of Mr. Bush was changed for the better by your balanced presentation of the President's faith. For this, I am thank you. To the naysayer, I refer them to the old testament example of Israel plight when a rightous, god-fearing king rule verse when kings ruled that "did evil" in the sight of the Lord. I was a bit hesitant to watch "The Jesus Factor". However after watching it I felt an even deeper respect for our President and the beliefs he has unashamedly stated. I found it entertaining to think that people are so concerned that he has beliefs that are centuries old, yet think nothing of things like gay marriage that will affect our children and families another generation down the road. It is frustrating to even ponder trying to explain to my children why two men or two women can get married. It's odd. Yet for the president to point out the obvious, that marriage is one man and one woman...duh! We have come to a point in our society that we have to define the obvious. I guess I just appreciate a guy that has the guts to say to the world things that most of us are thinking. Thanks for a well balanced story, I feel like you did a good job in this program. Thank you for such a straightforward, fact-based (as opposed to faith-based) report on the Bush trail. I, for one, am completely disgusted with a President who defends the Bible instead of the Constitution, and twists the Iraq war into a war between good and evil. Are we never to be done with religious wars? Future civilizations will look back at this period in history as another example of how backward we used to be. Religion itself must go the way of the Dark Ages. It is a holdover from that time period. It is for people who have decided to give up their own freedom of mind and ability to think critically about issues rather than just consult the bible. The bible was written by people who thought the world was coming to an end. That belief does not lend itself to rationality, to science, to the freedom of study and inquiry -- all of which Bush completely ignores. He burned up an awful lot of brain cells early in life, but this is no problem for an anti-intellectual America. "The evangelist sided with Barbara Bush by saying, "Don't worry about it. Live your life the way you're supposed to. Love everybody and move on."" "So Barbara called Billy Graham, and, said Bush, �Billy said, �From a personal perspective, I agree with what George is saying, the New Testament has been my guide. But I want to caution you both. Don�t play God. Who are you two to be God?� �"
I think Frontline misrepresented Billy Graham's position on this. 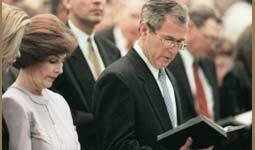 In FRONTLINE's program, "The Jesus Factor," Ken Herman, formerly a reporter for the Houston Post, recounts an anecdote about then Texas-gubernatorial candidate George W. Bush's declaration to his mother that "there is no place in heaven for anyone who does not accept Jesus Christ as personal savior.� As Herman tells it, Barbara Bush felt that "you shouldn't worry about it. �Just sort of take care of yourself." In the documentary, Herman recalls that Bush and his mother then called the Reverend Billy Graham, who Herman says "sided with (Bush's) mother." However, in his 1993 article for the Houston Post, Herman wrote that Graham sided with George W. Bush on theological grounds, but agreed with Bush's mother that they should "never play God." Thank you, Frontline, for such a super show on the President and his beliefs. I am also a born again Believer, so I agree with all he said. Obviously, the show was good for me. I pray for the ones who were upset by it. There is no danger from this President. We are not wild radicals like the terrorists are. We are just normal citizens like your neighbors who have told the secrets of our hearts. God bless you all. I have no doubt as to the strength of President Bush's convictions. Nor do I have any doubts as to the convictions of his supporters or any peoples of religious faith. I applaud their steadfastness. However, in terms of the President's political obligations, he must leave those most heartfelt convictions at the wayside when determining public policy for government must, and should, act at times in spite of religious sensibility not because of it. Simply debating the meaning of the 1st Amendment without placing in the context of the whole document belittles its significance. The great experiment of the United States is its ability to treat all of its people on an equal footing without showing favoritism toward any particular group.